I have bought the emulator to play my favorite game of pokemon, but the game doesn't save. I know this is because of some anti-piracy protection in the game, but is possible to save using a codebreaker. I have tried to write it in the cheats menu, but it doesn't work. What can I do? In the game's settings look for Custom Cheats, you can add your cheats there using the + at the top. 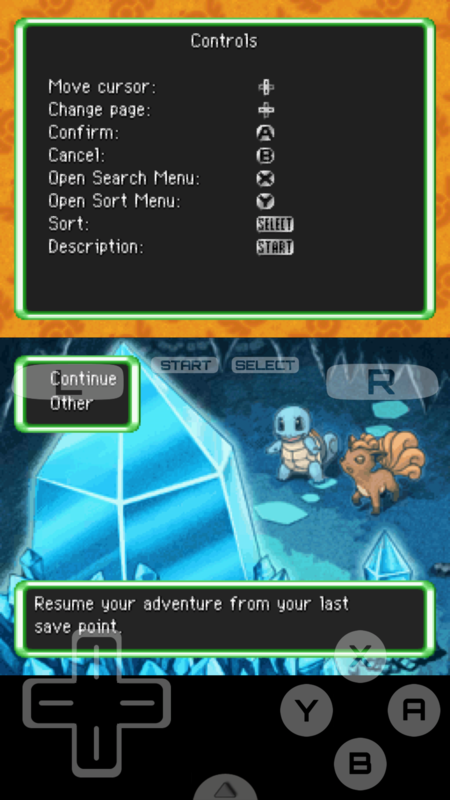 Pokemon Mystery Dungeon Explorers of Sky does not have anti-piracy protection, are you sure the rom you are using is not a rom hack or is not corrupted? This game saves fine in Drastic as far as I know. I have downloaded a lot of versions of EoS and every single one of them fails at save the game. The code for saving works fine in No$gba/Zoomer/Desmune, but nothing in Drastic. I'm not able to reproduce the bug on r2.5.0.4, perhaps you should join the beta and see if it works. I tested with the European version. Thanks! The problem with the saving was in the US version. It appears I downloaded a lot of US versions that said in the title EU, but I managed to get a real EU and worked perfectly. The thing is I don't know what to do know with the post (there is an option to close it, it has to do with an admin to close it), whatever. Thanks for the help, this emulator is worth the little amount of money, works perfectly.